The northern Pennines show the skill of civil engineers in conquering the challenges of forging routes for freight and passengers across the “backbone of England”, some with greater success than others. Eighteenth-century canal engineers struggled to reconcile the conflicting costs of engineering works, water supply and speed of traffic: of the three trans-Pennine canals, the Leeds & Liverpool Canal takes a circuitous course; the Huddersfield Narrow Canal was hampered by the difficulty of driving a lengthy tunnel, and by incompetent surveying and hasty construction; the Rochdale Canal avoided building a tunnel but aggravated its water-supply difficulties by building wide rather than narrow locks. The competing nineteenth-century railways between Leeds, Huddersfield and Manchester follow the same routes as the Rochdale and Huddersfield Narrow Canals, with greater confidence and elegance, while the Settle & Carlisle railway carves a superbly engineered route through challenging and beautiful landscape. 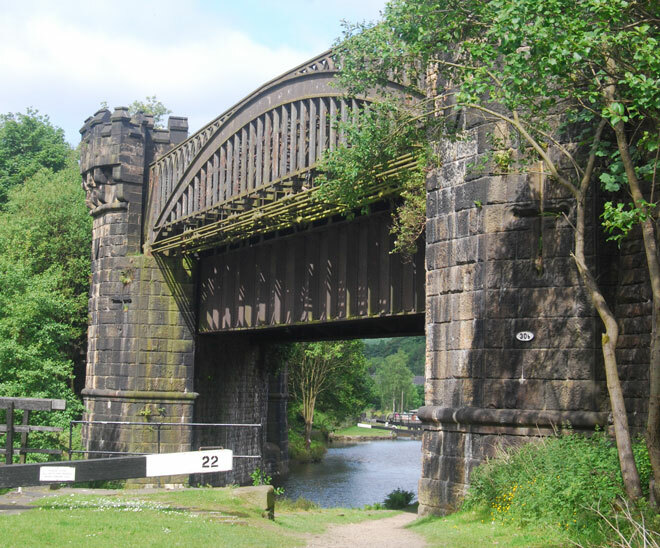 All three trans-Pennine canals and all three major railway lines remain open in the twenty-first century. Volunteers are primarily responsible for the restoration of the Rochdale and Huddersfield Narrow Canals, and volunteers’ efforts have preserved two interesting components of the railway network at the Keighley & Worth Valley Railway and the Wensleydale Railway. The 48-page illustrated handbook of this July 2011 tour provides detailed notes of the history and architecture of each of the above routes, together with explanatory sketch-maps and a reading-list.